Next to the well known beaches in the south of Portugal, like the Algarve, there are also great beaches on the Atlantic coast in the west. Nazaré, on the westcoast, is definitely worth a visit. 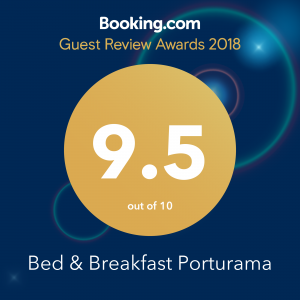 When you are arriving via Lisbon airport you might consider Nazaré as a stop on your way to Porturama. This original authentic fishermens village has become a hotspot for surfers from all over the world. Just outside the coast there is a deep trench which pushes the waves to record breaking heights. Therefore Nazaré has the world record for the highest surfed wave of a staggering 34 meters (that’s 111 feet!) These are monsters that you definitely want to see, below you find a link to an impressive YouTube movie. For the less-thrill seekers, the beautiful sunny Nazaré is also worth a visit to take a swim, stroll the boulevard or have a great seafood dinner. By car about 160 km (1,5 to 2 hours) from Porturama. Is it possible to get to the beach in less than an hour? Yes it is, within 60 minutes your feet can be in the water at the beach of Figueira da Foz (Fig tree at the mouth of the river) The city is situated at the end of the Mondego river. It is one of the most important coastal cities in the centre of Portugal. A large seaside town on the Atlantic coast with a beautiful boulevard and large sandy beaches. There are several nice bars and good restaurants. Figueira da Foz has a casino if you’re feeling lucky. Nearby you will find salt lakes and rice fields, at both you can spot a large variety of bird species. The beautiful town of Aveiro has lots to offer for a daytrip. Lovely canals run through the town and tourists can sail them with colourful boats. These boats are called “Moliceiro’s” and in the past were built to collect seaweed. Old and characteristic bridges are found next to modern buildings. Many beautiful old “art nouveau” houses are covered with the typical tiles. Aveiro is situated at an inland sea-arm which forms the “Ria de Aveiro”. The city is also famous for the sea salt that is being won. In the city you find amongst other beautiful buildings, the Misericordia church situated on the square “Praça da Republica”. This church dates back to the 16th century and also has those typical Portuguese tiles (Azulejos) on its facade.